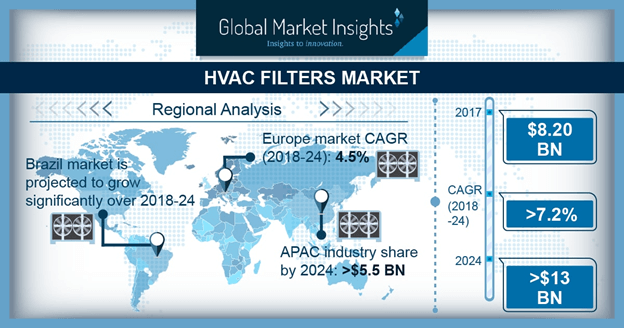 HVAC Filters Market size is set to surpass USD 13 billion by 2024; according to a new research report by Global Market Insights, Inc. Growing consumer awareness for contamination free air and reduction in airborne diseases would propel HVAC filters industry growth. Particulate contaminants include several airborne physical matters like microorganisms, pollens, dust, smoke, and fumes which are harmful for environment. The product provides effective means to control toxins by reducing their concentrations to adequate levels or eradicating them from the ventilation air, thereby stimulating market growth. Global pleated HVAC filters market size is anticipated to surpass USD 2.5 billion up to 2024. These filters have low pressure drops and are efficient having MERV rating between 5-9. They are used in commercial buildings and offices. The design intensifies surface area of filter, allowing it to capture more dust, dirt and allergens escalating product demand. Government regulations supporting the utilization of the product in non-residential settings including offices, institutions, and commercial sectors is likely to promote market growth. Encouraging initiatives from EPA, FDA, and EU relating to environment and use of safe refringent will have vital impact towards growth of HVAC filters industry. China HVAC filters market size may witness significant gains up to 4.5% by 2024. The product is utilized in food & beverage and construction industries to enhance clean air levels, protecting workers life. New product innovations and demand for reducing airborne contamination is anticipated to stimulate HVAC filters industry size over predicted timeframe. Rising economic standards with growing awareness about environment is likely to propel market growth. Cost concerning maintenance and installation of the product owing to high capital investment in production process might distress HVAC filters market price trends. Rising price of raw materials including nylon, polypropylene, and non-woven fabric can incur further compliance cost, which may hamper industry profitability. HEPA filters industry size may witness strong growth of over 7% at the end of 2024. These filters are utilized in healthcare settings owing to high MERV rating and efficiency. They are recommended by OSHA and EPA to enhance air quality and remove airborne infection in healthcare facilities. HEPA filter removes 99.97 percent of dirt, dust, tobacco smoke and other pollutants from the air driving HVAC filters demand. U.S. HVAC filters industry size is anticipated to surpass USD 1 billion owing to rising outdoor air pollution. It is an influential product which regulates and monitors air temperature, pressure, and air quality. Changing consumer preference for resisting air contamination with energy efficiency is likely to foster market growth. HVAC filters industry size from pharmaceutical application may observe strong gains up to 3% by 2024. Filtration in pharmaceutical plays a crucial role owing to manufacturing drugs safely and timely. High occupational safety necessities are increasing the need for a contamination-free environment in the pharmaceutical sector, thus propelling product demand. HVAC filters market is competitive and moderately fragmented with key industry participants including Koch, Spectrum Filtration, Tex-Air, Parker Hannifin Corp, Emirates Industrial, and Troy Filters. Manufacturers are making heavy investments in R&D, product innovation and capacity expansion in order to cater growing product demand.